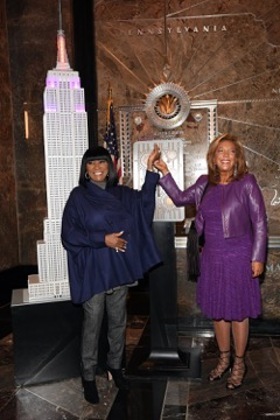 Patti LaBelle and Denise Rich, Co-Founder of Gabrielle's Angel Foundation for Cancer Research, “flipped the switch” to light the world-famous Empire State Building tower lights in red and purple this week in honor of Angel Ball 2015. Angel Ball – which took place at Cipriani Wall Street in New York City – is Gabrielle’s Angel Foundation for Cancer Research’s annual fundraiser to support their work to fund the nation’s best and brightest scientific investigators whose research focuses on finding less toxic treatments for patients with leukemia, lymphoma and related cancers. 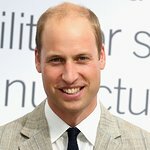 Since its inception, the Foundation has awarded more than $25 million in grants. LaBelle performed at the gala along with pop rock sensation OneRepublic and Tony Award winner Billy Porter. The evening honored the work of Heidi Klum; Amy and Brian France, Chairman and CEO of NASCAR, Founders, The Luke and Meadow Foundation; Mary Kitchen and Jon Orszag, Co-Founder of Compass Lexecon, Co-Directors of The Orszag Foundation; for their significant humanitarian and philanthropic contributions in support of cancer research.